Pereyra and Yamanaka at BFJ office in Tokyo. 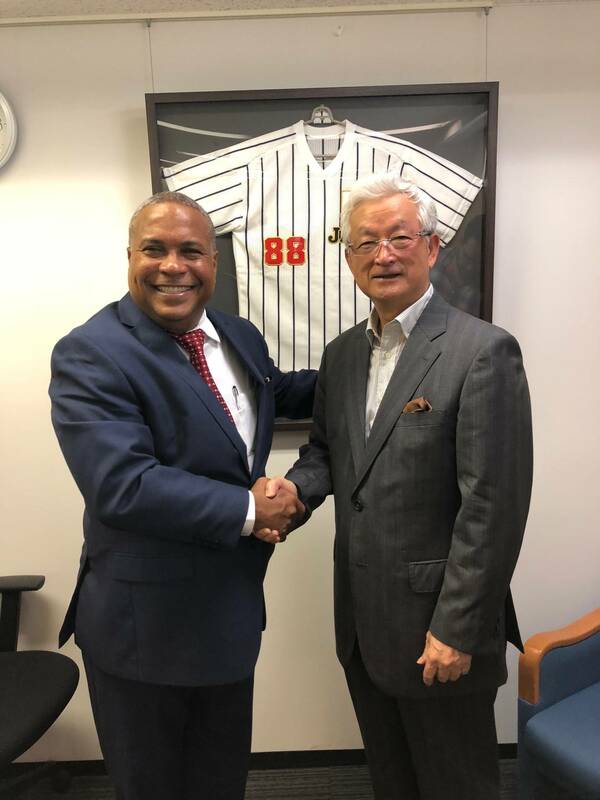 President Hector (Tito) Pereyra of Dominican Baseball Federation (#12 WBSC Ranking) met President Masatake Yamanaka of Baseball Federation of Japan (#2 WBSC Ranking) in Tokyo on Wednesday, June 27 to reaffirm the strong ties between the two governing sport bodies and exchange views on a number of subjects of mutual interest. Pereyra is also President of the Pan-American Baseball Confederation (COPABE – 30 Countries) and Continental America Vice President of the World Baseball Softball Confederation. On professional baseball, the Carp Baseball Academy run by Hiroshima Toyo Carp is their valuable supply source of Dominican players since 1990. Based on such a common platform, President Pereyra is producing a feature-length documentary entitled “BORU” (Ball in English) as Executive Producer. He is accompanied by a film crew on this trip and BFJ President Yamanaka was interviewed to be included as a part of the story. The film is about Dominican baseball players who play in Japan to tell their experience to be integrated into Japanese culture and how they discover new game mechanics while they adapt to the arduous discipline and customs. In “Boru”, the public will be able to explore a world that is not usually seen in Dominica from the eyes of compatriots and the unique diversity of culture. The film is in Spanish with subtitle in Japanese and English for release in the summer 2019, and is expected to open doors to tourism as well as trades between the two countries, in addition to the existing ties in baseball.